These through arch bridges are in a much different location than the bridge I discussed yesterday (in Utah's Painted Desert). However, they are remarkably similar in form and function. The Gateway Arch Bridges carry I-94 traffic over Telegraph Road just west of Detroit. 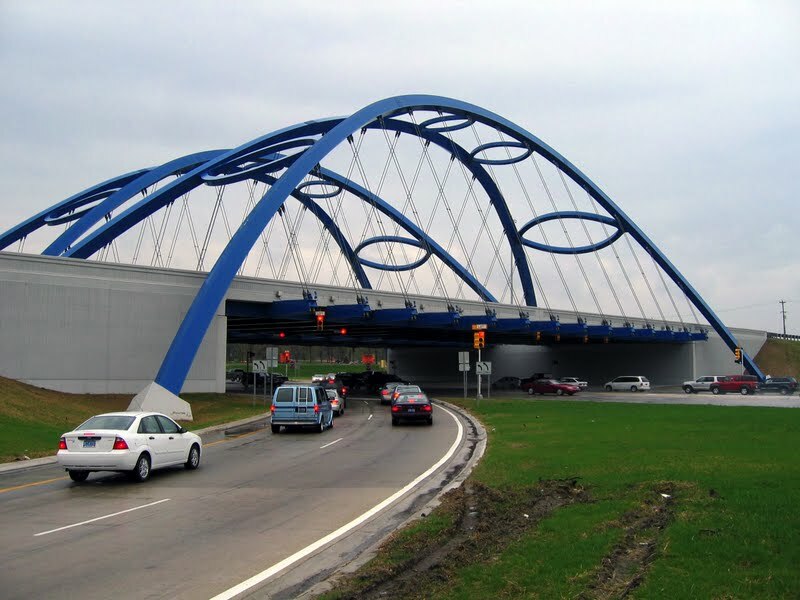 They replace an existing four-span bridge with a single span, while maintaining the same vertical clearance and without changing the elevation of I-94. This is another example of the versatility of arch bridges when a clear span greater than 200 feet is desired (the Gateway Arch has a clear span of 246 feet between the abutments). This length would be difficult to achieve from a steel or concrete girder bridge without using webs of ten to twelve feet in depth (which would change the vertical clearance, the deck elevation, or both). The through arch is a great choice when a narrow superstructure depth and a long span length are required. This is a great looking bridge. The bright blue arches with eye-shaped cross-bracing creates a powerful image. Also, you can clearly see how the ties hold up the 9" concrete deck with bright blue floor beams. The Gateway Arch Bridges are a successful combination of engineering and aesthetics. More information about these bridges can be obtained at http://www.lusas.com/case/bridge/gateway_arch_bridge.html. Arch Bridges: I-94 Gateway Arch Bridges by Mark Yashinsky is licensed under a Creative Commons Attribution 3.0 United States License.